In regions south of the Kanto District, there are ants that live under the skin of a decayed branch or tree. When you break off a branch and ants emerge, take the broken branch back home in a bottle or a bag. Examine a tree nut and soil mass by cutting it. Try to break off a dacayed branch. If you find ants, then take the branch back home. If you find a winged ant attracted to an indoor light at night, it is the day of the mating flight. This is your chance to catch a female. Next morning, look under stones or at the base of any trees near house. 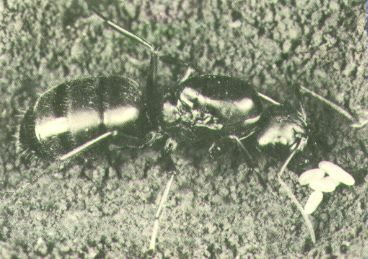 You can catch a female, which is easy to recognize because it is larger than the workers. Don't put many ants in one container. Pack sheets of tissue paper in an empty film can or small medicine bottle to roughly half fill it. When you collect ants, put them in the can or bottle. This can avoid possible injuries to the ants. + Ant species that can be kept only by raising females. - Ant species that can not be kept without nursing ants.